Guinness says a Tampa man made the world’s tallest hat. There is no record of his existence. Maybe Odilon Ozare traveled the world learning how to make hats. Or maybe his art is something bigger, and we’re all involved. TAMPA — Odilon Ozare adores talking about the hat. He will, and has, talked about it for hours with reporters and podcast hosts. He’ll tell you how he constructed it at his Seminole Heights home, where he lives with his seven cockatiels, Butterfly, Stoney, Superman and the rest, each named for Barbra Streisand albums. How he cobbles together a living as a freelance, high-fashion hat designer for high-profile clients found via an agent who secures him the highly confidential work. He’ll discuss the pros and cons of different hat-making adhesives, and headwear history going back to “medieval times,” when the dunce cap was “believed to help funnel the healing powers of God into a person’s head,” which, he will say, ties into another of his hobbies, researching the history of amateur brain surgery. At some point while talking with Ozare, even before he recounts his time making hats for the sultan of Brunei — fleeing that nation only after wearing a Santa Claus hat became punishable with prison — you will begin to question the eccentric details. By the time he gets to his supposed Guinness World Record for world’s tallest hat, and the professional surveyor “Sven Couture,” a name so awesome it seems obviously made up, you will decide, nope, this can’t be real. But dig a little deeper and you’ll find that Stephen “Sven” Couture is a very real guy. He recently took the official measurements needed for verification, and this week Guinness World Records confirmed it in an email to the Tampa Bay Times: “Tampa’s Odilon Ozare” has officially shattered the record for world’s tallest hat with his 15-foot, 9-inch, peacock-feathered creation. You look it up, and see that Brunei really did outlaw Santa hats. You begin to wonder if Ozare really is just an eccentric hat-maker, or if his art is something bigger. If by looking at it, you become part of it. It’s the more mundane things that are impossible to verify. 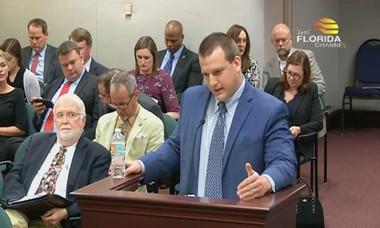 Ozare claims to be a longtime Tampa resident who went to Hillsborough High School, but there is no voter registration, driver’s license, phone or address records for anyone by that name. He said he doesn’t vote, and property ownership is an “imperialist system” in which he refuses to participate. He won’t let me come to his home to meet the birds or see his work space. Guinness World Records officials said record applicants are prompted to provide a full name on their application, but can give a stage name if they want. Ozare said it’s his legal name. We do know his hat will soon go on permanent display at Ella’s Americana Folk Art Cafe, where he hopes it will draw tourists to Tampa, and hopefully earn him “a reward” from Mayor Bob Buckhorn. Ozare’s efforts have already earned him coverage on Fox 13 news and from United Press International. He recently was asked to throw out the first pitch at a Bradenton Marauders minor league baseball game, which he did in a different hat, one he said is the world’s third largest. You can see him around this Saturday. He’ll be a “celebrity judge” during the weiner dog races at RiverFest in Curtis Hixon park at 1:40 and 3:30 p.m. Later he’ll be honored as a special guest at Ella’s Cinco de Derby party, where people are encouraged to participate in a best hat contest for prizes. “Have you ever thought about being the greatest reporter in the world?” he asked me this week. Here’s one possibility: Odilon Ozare is a mysterious, mustachioed hat designer who traveled the world “studying hats in their cultural context” before returning home to Tampa. His grandmother gives him hat supplies for his birthday. 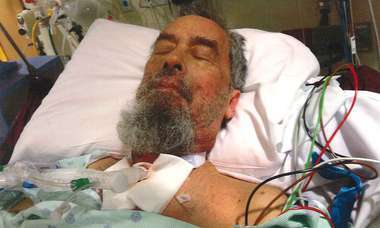 He has lived mostly off the grid, creating zero public record in a society where that’s nearly impossible. Despite his flamboyant appearance, you’ve never seen a photo of him or heard of his existence around Tampa, his supposed longtime home, until recently. That may sound unlikely, but if it isn’t true, here’s what would have to be: Someone, just for a goof, learned the ins and outs of hat-making. They memorized a detailed backstory, including enough Barbra Streisand facts to win a Babs trivia night. They spent the past year posting hat sketches and hat inspiration photos on Ozare’s various social media accounts. They became Odilon Ozare in the kind of transformation last seen in the movie Borat, never slipping out of character in interviews or during public appearances. All that, in addition to the indisputably real work of engineering a record-breaking hat, then navigating the pages of demanding Guinness World Records rules and requirements. That sounds pretty unbelievable, too. Two kinds of fake news are talked about often. There’s “fake news,” a derogatory term to undermine legitimate news organizations people disagree with, and there’s literal fake news, as in websites designed to look real that publish made-up stories for political or monetary gain. Then there’s a third type. In 2015, a man named Richard Jones captured a “lucky” photograph of a raccoon riding atop an alligator in the Ocala National Forest. 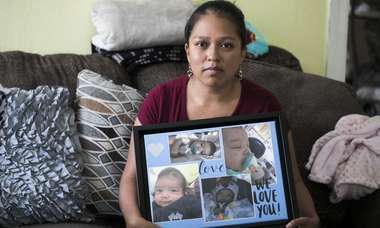 Sent to local ABC news affiliate WFTV, it spread to larger publications before going viral around the world. A year later, a New York performance artist calling herself Zardulu showed the Washington Post proof the gator and raccoon were props she’d covered with waterproofing spray and used to stage the whole thing. She’d also trained a rat to climb on a “sleeping” subway passenger and “accidentally” take a photo on his phone. “Selfie rat” was featured in mainstream news publications around the world. Zardulu claims to have planted dozens of these stories — she calls them “myths” — including “pizza rat,” arguably the most viral video of all time, featuring a rat pulling a slice through the subway. There’s zero money in it, and no political gain. Training rats to do anything, let alone press a button on an iPhone, is painstaking work. “It’s not enough to wish the world were more magical, sometimes you have to be the magician,” reads the pinned tweet on Zardulu’s account. If any neighborhood is associated with myth-making, it’s Seminole Heights, where Ozare says he lives. In 2014, a musician and artist there named Justin Arnold fooled local news outlets, including tbt*, into running a fake photo of a two-headed alligator. Today a taxidermied, two-headed gator is on display in Ella’s with a sign that maintains its authenticity, not far from where Ozare’s hat will go. There are other similarities. Photos of the hat posted online were watermarked “Andy Stern Design.” Stern happens be a former bandmate of Arnold’s and the only other person who reported the two-headed gator to the newspaper. Arnold and Ozare look a bit alike. Arnold is 39. Ozare is 37. If you really want to get kooky, the name Odilon Ozare does contain the name Arnold. The gator and the hat both fit into a tradition of Ella’s displaying art that gets people talking, said co-owner Melissa Deming. As far as she knows, she said, Ozare is just an eccentric local resident who came in with a hat about a month ago. 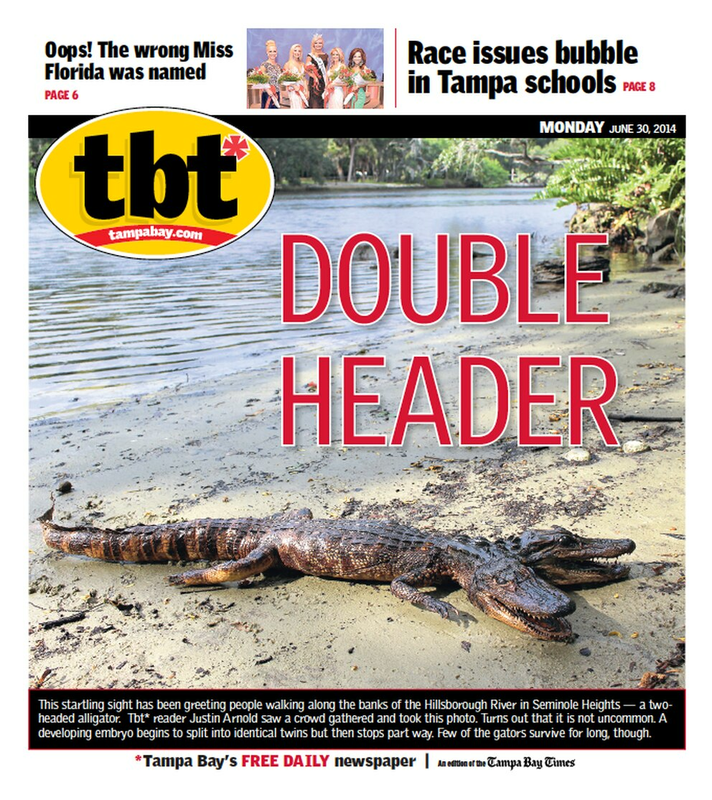 The cover of tbt* from June 30, 2014 featuring the two-headed gator. “He’s a man of many hats, no pun intended,” said Jason Marshall, host of the We Don’t Have Cookies podcast, who interviewed Ozare about the hat for 40 minutes for the show. What would he say if someone floated the theory that Odilon was actually just a character? 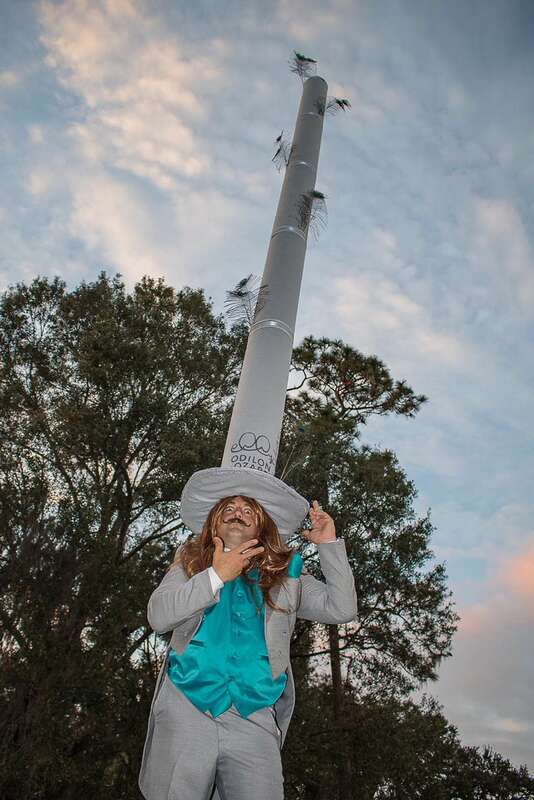 In the end, we have to focus on what we can know for sure: Tampa is now home to the world’s tallest hat. “I’m just trying to show that Tampa is a unique and interesting place,” Ozare said. That would be the indisputable truth.